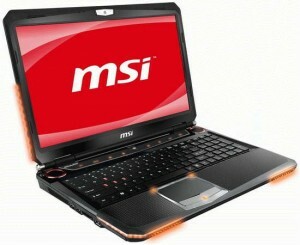 The Taiwan-based PC manufacturer, MSI, will be “parading its impressive R&D capabilities” as it exhibits the powerful GT683 notebook at the Computex show in Taipei. Aimed at gaming enthusiasts looking for an adequate desktop replacement, the new portable computer will reportedly feature a more rugged gaming keyboard with LED-backlighting designed by SteelSeries. As expected the laptop is built around a second generation Sandy Bridge Intel Core i7-2630QM central processing unit that has four cores, each with a clock frequency of 2.0GHz (goes up to 2.9GHz thanks to Turbo Boost). This chip supports Quick Sync Video and is currently ranked 15 in our CPU Benchmark List. In addition, the GT683 is equipped with a 15.6-inch widescreen display that has a resolution of 1920-by-1080 pixels and is capable of reproducing 1080p Full HD content. Supposedly, the four available DDR3 slots can handle up to 16GB of internal DDR3 memory and a RAID 0 accelerated dual HDD architecture, that doubles hard drive storage capacity and enhances read-write speeds by about 70%, allows users to order the gaming notebook with up to two 640GB HDDs. It is claimed that the new system will also be complemented by the recently announced NVIDIA GeForce GTX 560M (DirectX11 support/Shader 5.0) discrete graphics controller with 1.5GB of dedicated GDDR5 VRAM that operates at 775MHz. Furthermore, the manufacturer will reportedly ship this gaming laptop with a built-in DVD Burner. According to a company press release, MSI’s latest high-performance product features Wi-Fi and Bluetooth adapters. Additionally, customers will be able to take advantage of two USB 3.0 ports, a 4-in-1 card reader and an HDMI port. An integrated 2.0MP web camera for video chats is also available. The notebook will presumably run a copy of Windows 7 OS. The producer claims it has teamed up with sound design specialists to make sure the featured THX TruStudio Pro wrap around sound delivers “crystal-clear sound regardless of source”. MSI has still not disclosed GT683 pricing or availability details.